Do I Have to Eat Protein After a Workout? Downing protein after you exercise is a way to speed muscle recovery, according to researchers. If you're confused about having to do this, it's understandable. Not long ago, after a tough run or game, you would grab a Gatorade or some other sugary drink or food concoction. The scientifically validated idea then was that you required glucose to restore what had just been burned out of your exerted muscles. You needed to refuel and revive for next time, and a good dose of glucose was the best way to do it. It turns out, that concept was only half right. Consuming carbohydrates immediately after a rigorous workout is still an important part of restoring fuel to exercise-depleted muscles. Based on a 1966 study, scientists advised athletes to eat pasta or bread after exercise to replace the glucose burned out of the muscles by their intense efforts. Studies found that the quicker an athlete sat down to a meal of complex carbs after working out, the faster that the sugar would be replaced in the muscles and the muscles would recover. For almost 50 years, that was the accepted method for helping muscles recover. Muscles, however, are not composed of carbohydrates. They're made of protein. When they suffer even the slightest damage, the most effective method of allowing them to repair themselves is to supply them with carbohydrates and a small amount of protein. When you have some protein after your workout, you're providing your muscles with amino acids, a crucial building block that aids in muscle repair. Additionally, protein blocks the production of cortisol, a hormone that breaks down muscle tissue and exacerbates post-exercise soreness. Recent research on protein doesn't mean carbs are worthless. Ingesting complex carbohydrates after a workout still replaces depleted glycogen stores and aids in recovery. Dietitians suggest having between 10 to 20 grams of protein with as many grams of carbs equal to half your weight in pounds after you exercise for a better recovery. Clif bars, Gatorade with protein, Odwalla Protein Monster drink and juice mixes with protein are available at supermarkets and health food stores to meet this need. 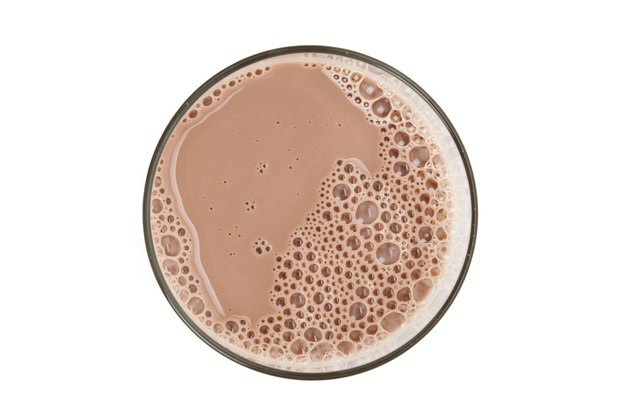 But the perfect protein-carbohydrate, post-workout supplement may already be in your house -- 8 to 16 ounces of chocolate milk is packed with both the glucose and protein that scientists recommend to speed recovery. Making sure that the protein and carbs hit your muscles at the right time is as important as making sure you hit them with the right amount of carbs and protein. Researchers and coaches recommend having protein and carbs 30 minutes after you finish your workout. If you can stir up the chocolate milk, or have a cup of yogurt within 10 minutes after your exercise session, it will be even more effective in aiding muscle recovery. The amount that you consume should be relative to your workout. If you are just coming from an aerobics class, a simple glass of chocolate milk should be enough to refuel your body. What Happens If I Eat a Protein Shake Before a Workout? Why Is Eating a Banana After Jogging Good? Why Drink Chocolate Milk After a Workout?